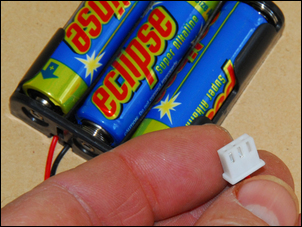 Make your own electronics for automotive, model railways, renewable energy, alternative powered vehicles, educational uses and lots more! 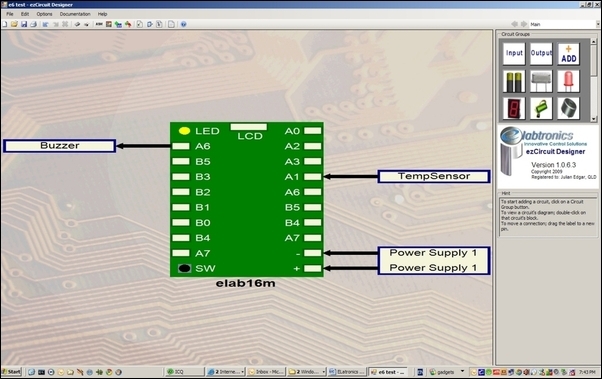 The eLabtronics ‘EZ’ system revolutionises DIY electronics. Whether you want to sound an alarm when a temperature is too high, switch on lights when it gets dark, intelligently operate motors or solenoids or buzzers, or even monitor an engine management sensor in a car, the EZ system provides both the hardware and software to do it. It requires almost no programming skills, yet gives you the power to develop custom electronics as simple – or as sophisticated – as you like. You don’t need to assemble electronic kits, learn difficult software programming skills – or even know much about electronics at all. In fact, the system is literally kids’ stuff – it’s used in educational applications as well as hobbyist electronics. But while it might be incredibly easy to use, the potential applications are just amazing. If you’re interested in custom electronics for cars, model railways, solar energy, alternative powered vehicles, low voltage lighting – or hundreds of other uses – then this system is for you. In short: the cost is low, the functionality is high and the creativity is in your hands. 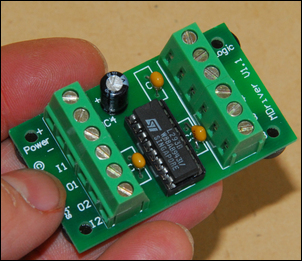 At the heart of each electronic module is a fully programmable microcontroller. Depending on the particular hardware module, in addition to the microcontroller there might also be on-board LEDs, switches or even LCD displays. These modules are fully built, are low in cost (starting from under AUD$14!) and yet can perform ‘real world’ functions. Several modules are already available and a host of new ones are in development. Currently available modules include the eLab6, eLab6P and eLab16m. Without at this stage going into great detail, these modules (that run off 5V or a small 3-cell battery pack) can operate LEDs and buzzers, monitor sensors and make intelligent decisions. The eLab16m can also directly drive an LCD alpha-numeric display. 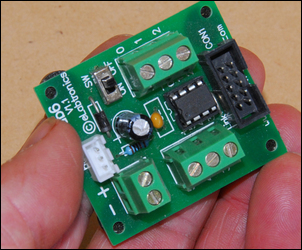 By adding the small L293D motor driver module (it costs AUD$11), you can also operate relays and drive small solenoids and motors. Programming of these modules requires the use of a specific USB programmer (covered below). In development are hardware modules that will allow you to drive high power motors, lights, fuel injectors and solenoids. 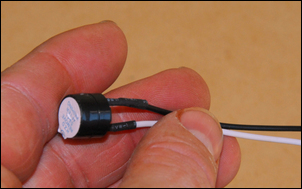 They will also be directly programmable from the USB port of your PC and run off a wide range of supply voltages. 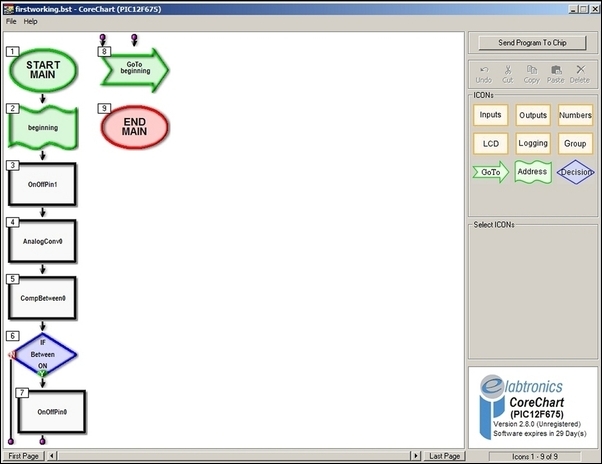 ezCircuit Designer (a screen grab is pictured above) is free software that shows you how to connect external components to the hardware modules. 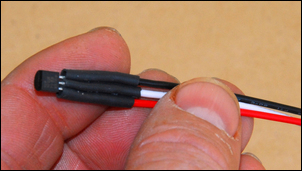 For example, you can on-screen ‘connect’ LEDs, buzzers and switches. 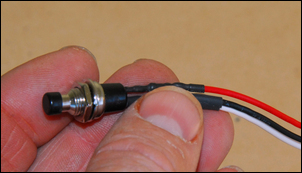 You can connect inputs from light or temperature sensors – or even from an engine management sensor in a car. 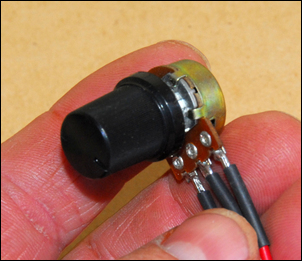 Pictures of common components are included so you can literally just click to add a LED, pushbutton switch, etc. But this software isn’t just a drawing program. It also shows you which pins are available for the different input and output connections (ie it guides you in making the right connections), and exports all this data to the next step in the system – ezCoreChart. ezCoreChart software (a screen grab is pictured above) allows you to develop the program that will run inside the hardware module. It uses easily understood click-and-drag programming boxes so that all you need to do is assemble a flowchart showing the process you want to occur. All the labels you’ve used in ezCircuit Designer are retained, so you don’t have to struggle to remember weirdly named inputs and outputs. This software is also free. The functionality of ezCoreChart allows you to deal with multiple inputs; to perform mathematical functions like divide, subtract, multiply and add; turn on and off buzzers and LED indicators; easily display information on the LCD, and perform a host of other functions. ezCoreChart is the killer application – it lets you write software for the microcontroller without having any background knowledge in computer programming at all. The programmer plugs into your PC’s USB port and connects to the hardware module. When you have finished building the ezCoreChart program, one button press sends it to the hardware module. If you want, you can reprogram the hardware modules hundreds of times, making as many changes to the program as you like. 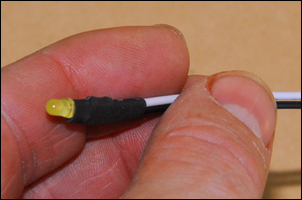 Including the cable, the programmer costs AUD$40 (for Australian readers, +GST = AUD$44). The programmer can also be used for a completely different function – as a multi-channel 0-5V PC data logger. See Five Channel USB Data Logger, Part 1 and Five Channel USB Data Logger, Part 2. 1. 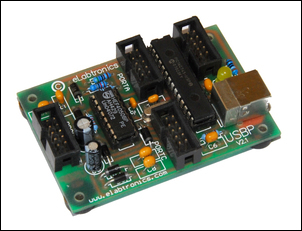 Pick the eLabtronics hardware module appropriate to your needs. 2. Open ezCircuit Designer, select the correct hardware module, and then make the wiring connections you want on-screen. 3. 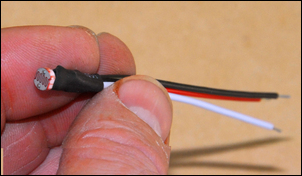 Make the actual wiring connections to the module (print out or follow the ezCircuit screen so you can see what connections to make). 4. Open ezCoreChart and click and drag the different boxes to build the software program, just like drawing a flowchart. 5. Use the Programmer module to send the program to the hardware module. 6. Test the programmed module. Compared with traditional analog electronics, the cost is vastly reduced, you don’t need any electronics design skills, the versatility is huge and you can achieve exactly the outcome you want. The best starting approach is to buy an eLab6 (AUD$12 + GST) and the eLab6 EZ Starter Kit. This costs AUD$32.50 (+GST). eLab6 hardware module – this board is fully built and contains a microcontroller and a few other components, including an on/off switch. The eLab6 can directly drive LEDs and low current buzzers, runs off 4.5 - 5V (in car applications, a 5V supply is available from the ECU), and can perform functions like monitoring temperature sensors, light sensors, the airflow meter, throttle position sensor, etc. Used in its most common mode, it has two inputs and two outputs. The ezCircuitDesigner and ezCoreChart software packages are downloadable from eLabtronics. You can play with these software packages, at no charge and without buying any hardware, to get a preliminary feel for how the system works. 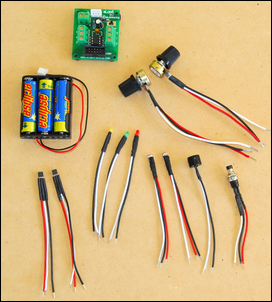 The eLab6 EZ Starter Kit is not a toy – as you’ll see over the next parts in this series, you can build real and effective electronics with it. It’s simply nothing like some of those ‘learner’ electronic kits that you often come across, where after the lesson is finished you’re left with useless junk. If you’ve often thought to yourself: “Gee there must be an easy way of doing this with some electronics” – but have then been confronted with selecting integrated circuits, designing the project, building it, fault-finding it (and then giving up in disgust! ), the eLabtronics EZ system is for you. Rather than trying to achieve outcomes with unique electronic hardware configurations, it’s done with easy programming, allowing literally millions of different functions to be performed by the same modules. Basically, it fast-forwards DIY electronics into this century. Next in this series: building a custom programmable temperature alarm.